Roma squandered a chance to gain valuable points when they drew in matches against minions Parma and Hellas Verona in early February. Which is why they find themselves 9 points behind leaders in the Serie A standings at the present moment. Juventus, the reigning Serie A champions have beaten their rivals from Rome on 61 occasions of the 77 times they have met. Roma's last major success was in the 2000-01 season when they won the Scudetto. Roma coach Rudi Garcia's challenge to Juventus about winning the Italian League this season has been seriously punctured by six drawn matches in their last seven appearances. Juventus has been in great form on the other hand remaining unbeaten in 2015 which includes just 2 draws in away games against Udinese and Cesena. A 3-1 win against arch-rivals AC Milan was one of the highlights of this unbeaten run. Barring the occasional scoring form of Francesco Totti, Roma are a bagful of woes. Right back Maicon and Colombian striker Victor Ibarbo are on the injury list. The likes of Kevin Strootman, Leandro Castan and Federico Balzaretti have been out of action for a long time. Miralem Pjanic and Seydou Keita, both of whom form the heart of the Roma midfield have been seriously lacklustre, lacking in initiative and thrust. That's enough reason for the likes of Tevez, Pogba and Morata to tear through the Roma midfield and defense. Even a very fluid Roma of last year were not able to overcome their rivals from Turin in a match which Juventus won 3-2. Coming out of their UEFA Champions a 2-1 win against Borussia Dortmund, Juve will be visiting Olimpico stadium on Sunday night with a clear psychological advantage while the phalanx of recent drawn matches will weigh heavily on the hosts. The match undertone could be expected to be fiery given the fierce rivalry between the two. 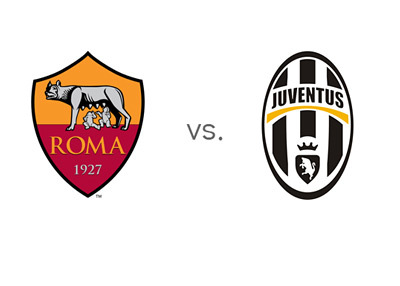 Although it would be an away match for El Bianconeri, one can expect them to triumph. Moreover the 9-point cushion will give the visitors great comfort. The odds apparently look quite in favour of Juventus. Please note that legendary Andrea Pirlo is out for approximately three weeks due to injury.